Rabbi Paul Citrin, Editor: A cross-section of rabbis respond to questions under one of three categories: 1) On God; 2) On Our Humanity; 3) On the Jewish People. Their responses include thoughtful, personal essays about God, ethics, humanity, suffering, evil, the soul, after-life, interfaith dialogue, and more. Rabbi Paul Citrin, editor of this important work, will be speaking at Bookworks on Rio Grande on Tuesday December 2 at 7:00 pm. Rabbi Citrin will also be offering a course on the book at Congregation Albert and at Congregation Nahalat Shalom in February-March 2015 (not as far off as it may seem!). Download the Study Guide and prepare for Rabbi Citrin's course at Congregations Albert and Nahalat Shalom in February-March 2015. The intention of the contributors of this volume is to expand the knowledge and understanding of the readers in Jewish life, practice, and identity. They strive to encourage further study and ongoing questioning. Judaism's intellectual and spiritual tools are presented as a means for leading a life of purpose and commitment. A volume that made a large impact on me was something published by the American Jewish Committee in the mid-60s called The Condition of Jewish Belief. It was a symposium compiled by editors of Commentary magazine where 38 rabbis from all of the streams of Judaism responded to five theological concerns. I found it to be tremendously interesting and helpful as an undergraduate student in Los Angeles. It recently dawned on me that there was nothing like that on the market today. I looked at 12 different publishers that produce Jewish books and there was nothing that came close to it, by which I mean a collection of essays by various contributors not targeted for either children or graduate students in philosophy. 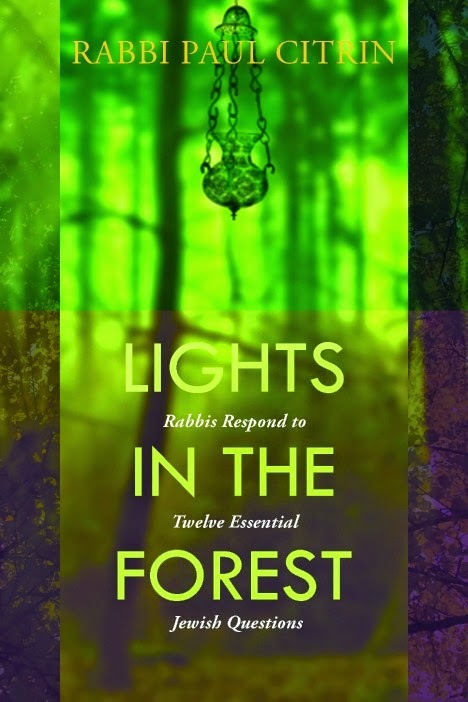 The questions in the book are stimulated by real questions that congregants ask their rabbis. I find that there is a core of Reform and Conservative Jews who want to be well-grounded in Jewish tradition. Their Jewish knowledge and identity is a central part of who they are, even if they don’t have all of the formal education they may desire. This volume will help strengthen that serious commitment. Want to learn more? You can purchase Amazon's Kindle edition here, or purchase the paperback edition from CCAR Press here. And don't miss the opportunity to hear Rabbi Paul Citrin speak in person!